Nuclear energy has been used for a long period as peaceful means such as electric power production, medicine and treatment, research and development in many fields. Owing to the cross-border character of the environmental problems arising from Military Installations and activities, international cooperation is of special significance with field of environmental monitoring, reclamation of contaminated military sites, and agreements of abiding and complying with nuclear proliferation. In the beginning of this year, a new unit called Nuclear Energy and Radiation Protection department (NERP) was established in the Palestinian energy authority. This unit will be the governmental competent authority responsible for policy and legislation making to supervise and promote the peaceful application of the ionizing radiation and establishing a Palestinian radiation protection and safety program. Ä Determination, description and Analysis Of exiting ionizing radiation Sources In Palestine and identification of the users of their sources. Ä Assessment of present situation of radiation protection in Palestine. Ä Policy and legislation making to control and supervise and promote the peaceful applications of the ionizing radiation and radiation protection. Ä Introducing and applying mechanisms for notification, registration and licensing of radiation sources and radioactive materials. Ä Public awareness and training the local staffs in the field of ionizing radiation application and radiation protection. Ä Exchanging experts and information concerning the field of nuclear energy application and radiation protection. Ä Co-operation with the regional and international Agencies working in the same field. Ä Being the government, competent authority and contact point with the international atomic energy agency (IAEA). Ä A survey of ionizing radiation applications in Palestine was carried out in April-may, 1998. Ä A setup of a strategic plan for 1999 – 2003 was laid out. 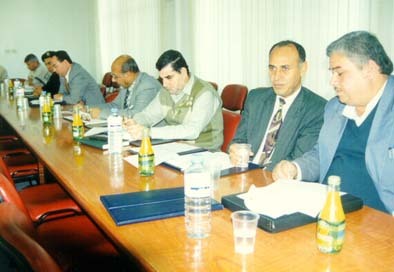 Ä Five days -training course in radiation protection for 25 local staffs was organized towards the end of June 1998. Ä Preparing for a project focusing on the studying of the natural background radioactivity in Palestine. Ä Preparing to carry out training program in x-ray photographing technique in cooperation with health ministry.